March is National Ladder Safety Month, and that means experts from all over the country are weighing in on proper ladder use at work and at home. Of the more than 500,000 people treated for ladder injuries each year, approximately 300 die, according to the Centers for Disease Control and Prevention. 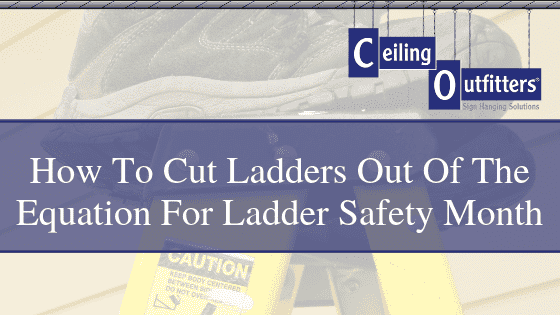 But in the vast majority of ladder injuries and deaths are preventable—in many cases, injury victims never needed to be on a ladder in the first place. Our CEO, Thomas Stanley, understands that the best way to avoid ladder falls is by avoiding getting on the ladder in the first place. While the Occupational Safety and Health Administration provides extensive guidelines on the proper use of ladders, right down to the types of skid-resistant materials required on rungs, not all employers follow them. These preventable ladder injuries lead to millions of dollars each year in healthcare costs and workers compensation cases, but the American Ladder Institute (ALI) seeks to change that through Ladder Safety Month. Since 2017, ALI has called on safety professionals to help reduce ladder-related injuries and deaths. However, climbing a ladder is inherently dangerous. That’s part of the reason Ceiling Outfitters promotes the Clik-Clik magnetic system for hanging signs and managing ceiling displays. With a ladder, it typically takes two to four people to hang a banner or sign in your retail or manufacturing facility. Moving the ladder across multiple locations is time-consuming (and risky—especially with metal ladders, which can conduct electricity). In addition to paying multiple people to hang signage, there’s a laundry list of regulations employees are required to follow. And though safety is a noble pursuit, it isn’t the only benefit of using a ladderless system to hang signs – it also saves business owners time and money. One person can transport, set up and install signage using a ladderless system quickly and easily. There aren’t any government safety regulations on hanging signage from a ground-based position, and even better, the Clik-Clik system’s fiberglass pole is non-conductive. 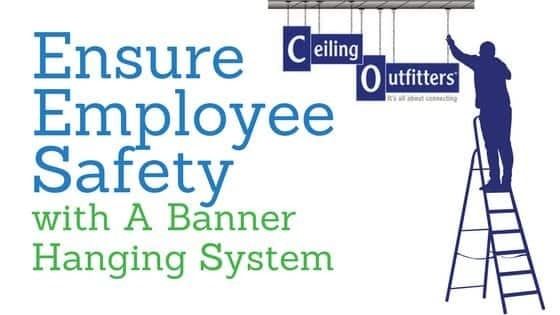 Ceiling Outfitters offers various systems that are designed to simplify and streamline sign and banner-hanging processes, enabling employers to reduce the number of personnel and increase workplace safety. Our most popular solution is the Clik-Clik™ Magnetic Sign Hanging System Starter Kits. These kits come with everything you need to get started hanging ceiling signs in your retail or manufacturing facility. It includes the MagPole™, Dual MagMover™ (allows you to install two magnets), two bags of 10 Super ClikMagnets™ and 82 feet of LoopLine™ that allows you to hang your signs straight the first time. “A lot of people who work with us share their stories about being injured by falling off a ladder long after the fact. When we demonstrate the Clik-Clik ladderless system, their typical reaction is, ‘Where were you eight months ago when I needed this?’” says Stanley. 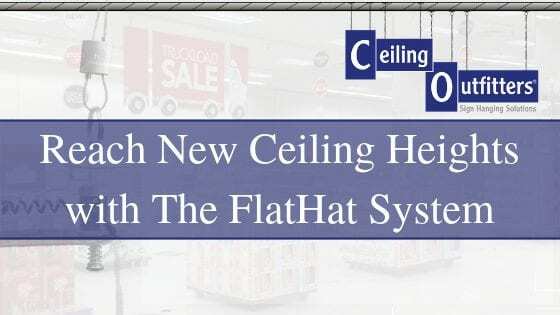 Since 2007, Ceiling Outfitters® has partnered with over 2,000 organizations and 22,000 stores nationally within the retail, manufacturing, education, and hospitality industries. Ceiling space and storefront windows are optimal visual display locations and we help customers utilize these areas safely, quickly, easily and more economically. 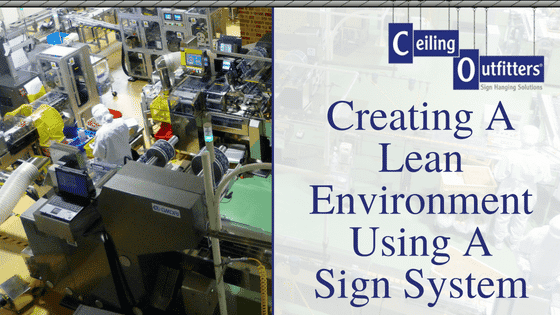 We are the master distributor of the Clik-Clik™ family of products, the premier magnetic hanging system that transforms the ceiling eco-system into a workable location for strategic placement of ceiling signs and displays and helps employees suspend items without a ladder or lifting device.